Can't believe it's February already, and ♥ Love ♥ is in the air! 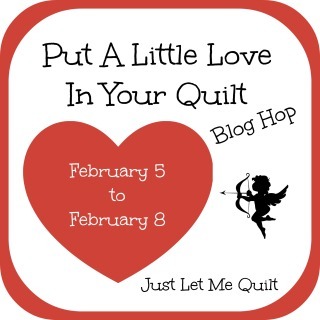 A Big thanks to Carol @ JustLetMeQuilt who came up with just the motivation I needed to finish a quilt and participate in this "Love-ly" blog hop! The quilt went together so quickly, I wonder why I waited so long! Here are the instructions in a nutshell. squares using your favorite applique' method (see below). Make 9 blocks and trim to 9-1/2". Cut 8 @ 1-3/4" strips of each. 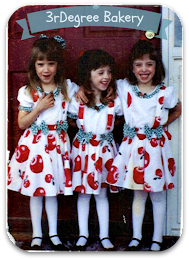 Stitch pairs together, press seams to one side. to make 16 @ four-patch units. Trim to 3" square. Lay out as pictured, alternating colors and rotating 4-patch units in opposite directions. Stitch together in rows, then stitch rows together. Border/Binding: 1 yard; Cut 4 to 5 strips @ 4" x width of fabric for borders, apply to quilt. I enjoyed freemotion-quilting this quilt with a few of my favorite heart motifs: an echo-heart background fill, feathers, and interlocking hearts in the sashing. And feathers are basically the shape of half a heart, so that seemed to work ok.
At any rate, the quilt is done, Yay! I am so excited to cross this UFO off my list! 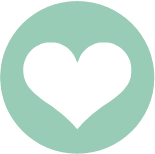 You may have seen these little heart blocks floating around my blog multiple times in the past 5 years (!! ), as each block was part of a series of applique' basic tutorials for Riley Blake Designs' Cutting Corners. It turned out to be a pretty thorough exploration of a variety of ways to not only prepare the fabrics, but to apply the applique' (the applique'tion, lol) - I learned a lot! Of course, these are not all the ways that you can applique', but I thought I would list all the tutorial links below, that way I'll have them all in one spot. Then, of course I had to have some matching pillows. And here's a link for the Heart pattern with feathers. What is your favorite applique' technique? 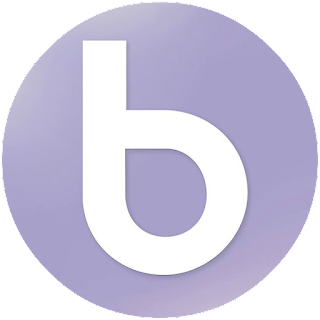 Lately I've been skipping the sewing step and going directly to "Appli-Quilt". 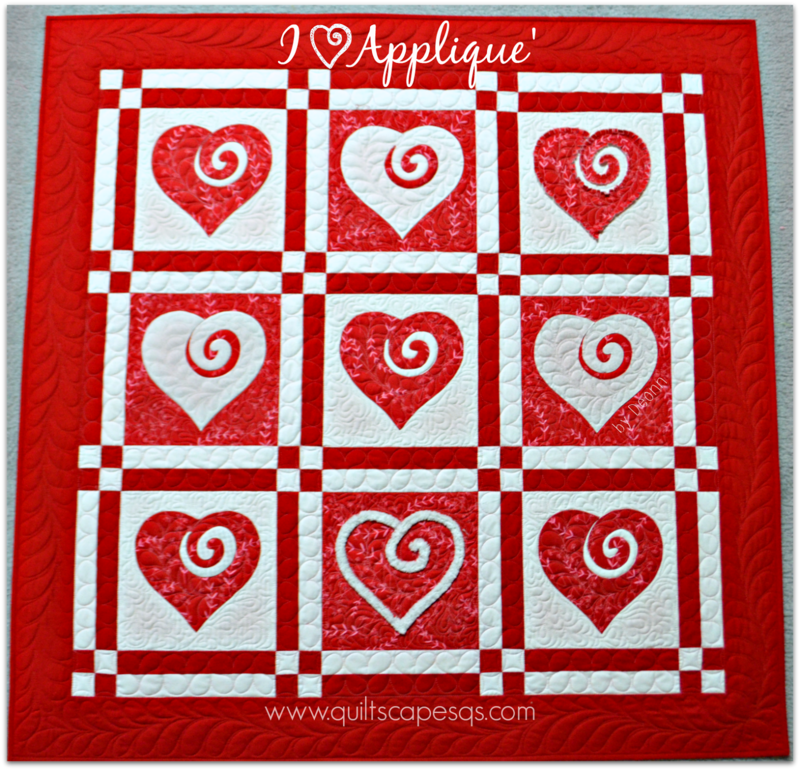 Let me know in a comment how you feel about applique' and I'll draw a name on Friday for a little special Valentine treat. UPDATE: Congratulations Vicki! You've won a few treats from Heber Valley! For more love, be sure to visit these wonderful ladies today. Check out Carol's blog HERE for the master list, and to enter for a wonderful drawing of some sweet RBD fabric! Also - she's got a Pinterest page for the hop HERE! 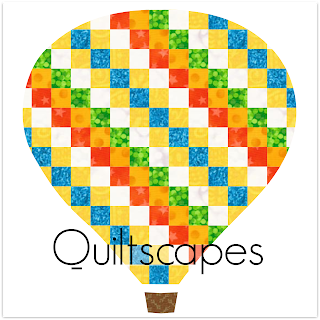 Quiltscapes << Thanks for coming by! Thats a unique heart, I like it! Love your quilting for this too. I am not much of an applique gal, a little bit, here and there, but that is all. I love doing Freezer paper Applique. Those hearts are Adorable!! 5 years in the making, WOW!! I love the look of applique - I have yet to find the method of doing it that I love. This is just lovely! I love the look of applique, especially when it's added to something pieced. It gives a quilt and extra special touch, I think. I used to not enjoy applique, but I seem to do a good amount of it these days. So somewhere I crossed the bridge of I don't mind doing it, however, mine is all done on the sewing machine. LOVE your projects!! Absolutely delightful! Definitely bookmarking this post for future reference! Such a pretty quilt and so much information on the different ways of applique, I'm intrigued. Thank you for always challenging me and inspiring. Love your quilt too!!! Deonn ! .......... GORGEOUS !!! Deonn, I love your quilt and the quilting is beautiful. Thank you so much for the links I would love to make a quilt like this. My favorite applique method is needle turn hand applique' Thank you for the giveaway and for sharing today. 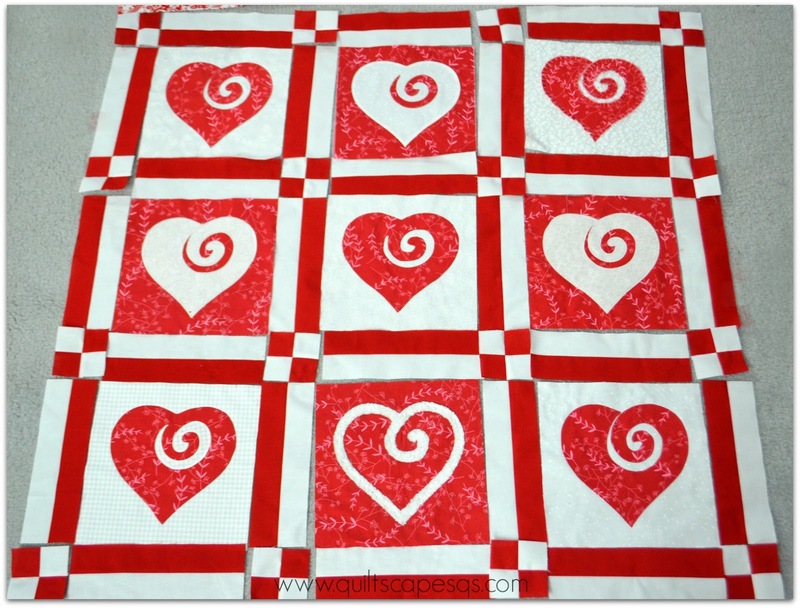 Deonn, This is such a beautiful heart quilt...love the swirls in the hearts! You do such amazing quilting on all your projects and this was no exception. 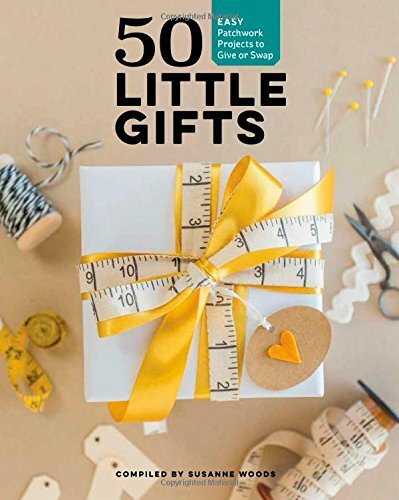 Thanks for the links to tutorials and for being a part of this fun blog hop sweet friend! 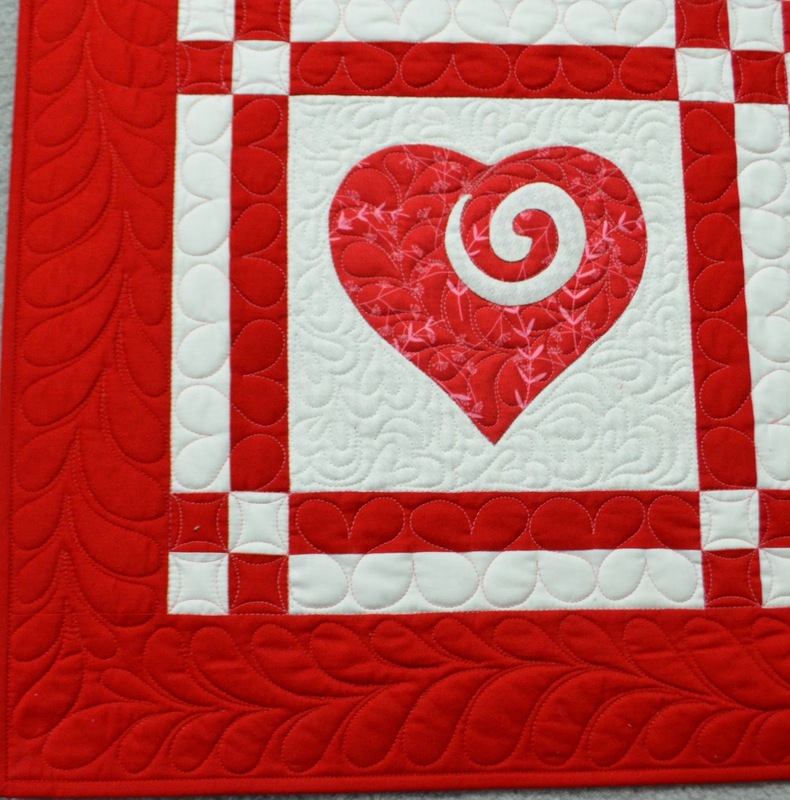 Your heart block is just darling and your quilting is awesome - love the feathers! Great quilt. 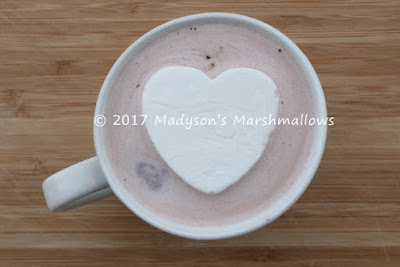 Cute heart design! Thanks for sharing and inspiring. Love your heart quilt! And I freely admit to squealing over those pillows! Your quilt is beautiful. I have seen your hearts before and have loved them each time. The quilting is also gorgeous. Thanks for the tutorials. What a beautiful heart quilt! The quilting is just fantastic! I like doing a little needle turn appliqué. Very pretty quilt. I like that there is some detail in the hearts. I am also a fan of alternating colour schemes, even though I don't use them much anymore. I applique using fusible and a machine stitch. On rare occasions I may use fusible and a hand stitch. Thanks for the chance to win something special. Love your quilt and the quilting looks wonderful...I have been trying my hand at some hand applique lately. Beautiful quilt, Deonn. I love your hearts. My favourite applique is wool as I can take it okn road trips and work on it while hubby is driving. I find wool very forgiving. lol. Your quilt is sweet but your quilting is spectacular. Regarding applique, don't do it often but if I need to do a curve of any type I use aluminum foil to wrap the fabric around the template and press firmly to eliminate the bumpy edges. Love that heart! Different and so clever. Thank you for sharing ..
Beautiful applique! Thanks for sharing. Great quilt and I love those heart cushions too. Love your heart pattern. I like hand applique the best, although I see quilts done by machine, and they look nice. But I don't seem to have too much luck with the fusible applique technique. I rarely do applique, but have done turned-edge, hand applique and liked the look. I'd like to play with turned-edge blanket stitch and raw-edge double blanket stitch. 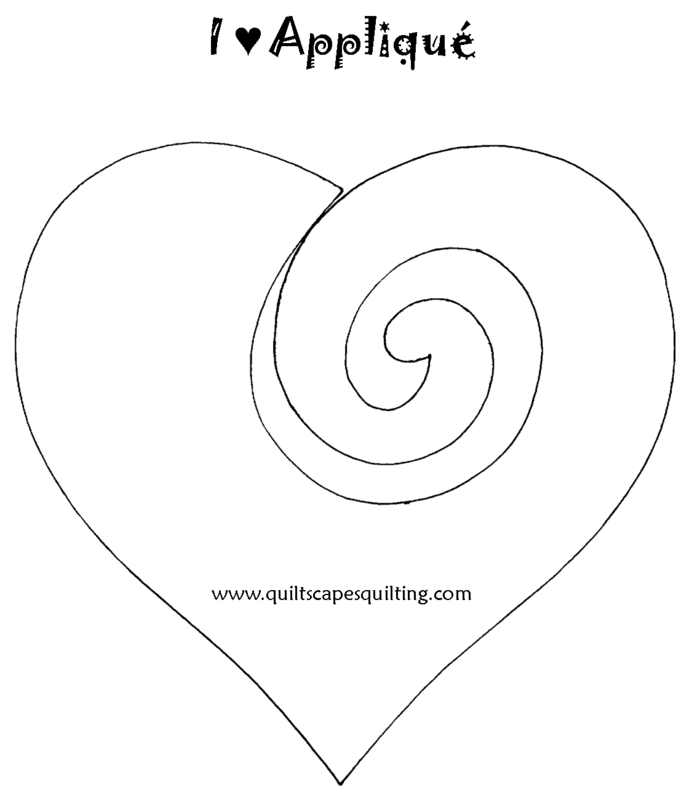 Nice to see all your examples and love the heart design with the swirl. I love needle turn applique! Such a lovable quilt, so pretty. Your quilt is so darned cute. The sashing and cornerstones add the perfect touch. Yes, I've seen this heart a few times but they didn't make as big an impact as this quilt. 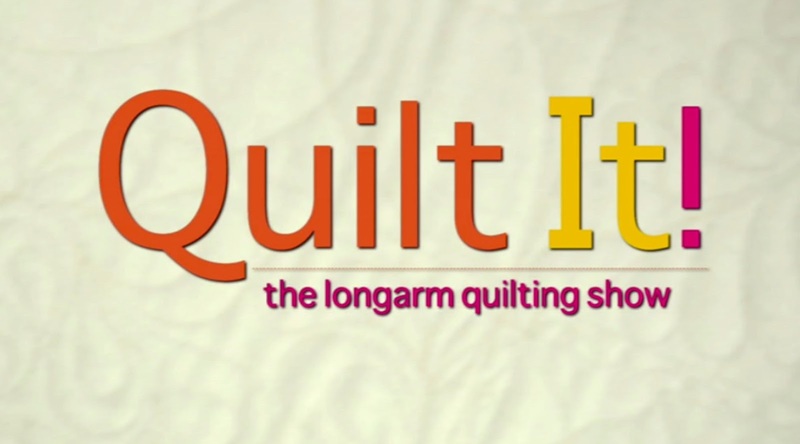 Thanks for sharing all your quilting ideas. Happy Heart Day. Your quilt is perfect! 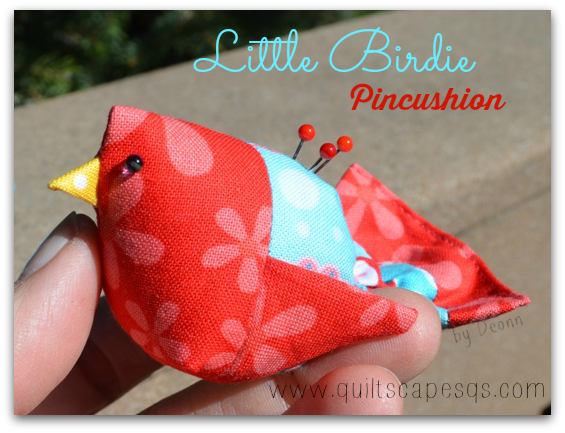 Thank you for sharing your tips and the links to the different ways to do applique. I have tried different methods, but taking a step back now to figure out how to apply binding by hand. Hope that will help me when I finally do get to applique. Your quilting is lovely and really enhances the quilt. Great idea to make pillows too! I like both hand and machine applique. Love your hearts. Thank you. Wow! This is incredible! I love applique, but I mostly do embroidery machine applique. However, I do like doing it the old fashioned way on the sewing machine. I have a Christmas quilt done that way, and I really need to finish it. Your quilt turned out great! And thanks for sharing the appliqué pattern. I usually do raw edge appliqué...I am too impatient to do other "fussier" techniques! I am learning. Raw edge with a straight stitch, raw edge with a satin stitch, raw edge with a decorative stitch, I have yet to brave "needle turn". I am also kind of wondering about a technique I saw using modpodge. Very pretty quilt, and the quilting is lovely too. 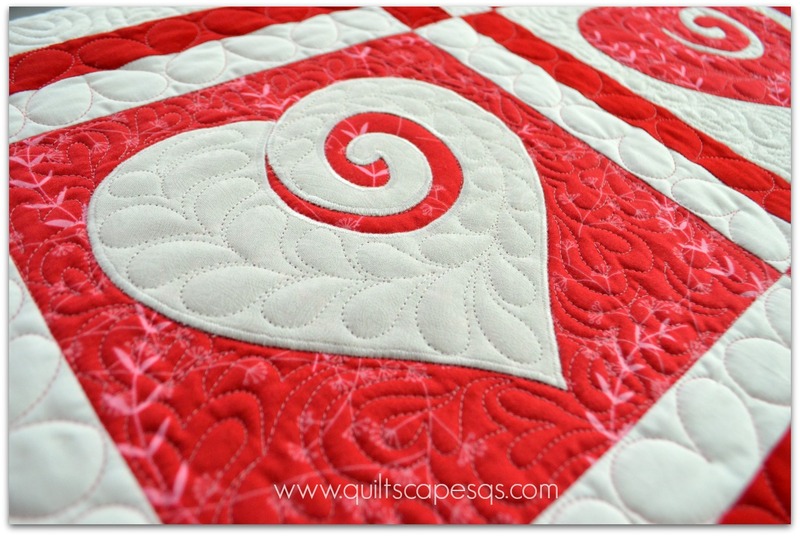 LOVE those swirly hearts and that fancy quilting!! Love the heart blocks, and the setting is great! Red & white is such a great combination. I usually do machine applique with a blanket stitch, mostly with black tread if the project is one for our pattern shop, but sometimes with matching thread. I prefer piecing though! Happy Valentine's Day! That's such a sweet quilt, and pillow set. I usually do either fusible or the interfacing/stitch/turn and fuse method, with machine stitching. It depends on the look I want, and if the design allows the interfacing method. Thanks. 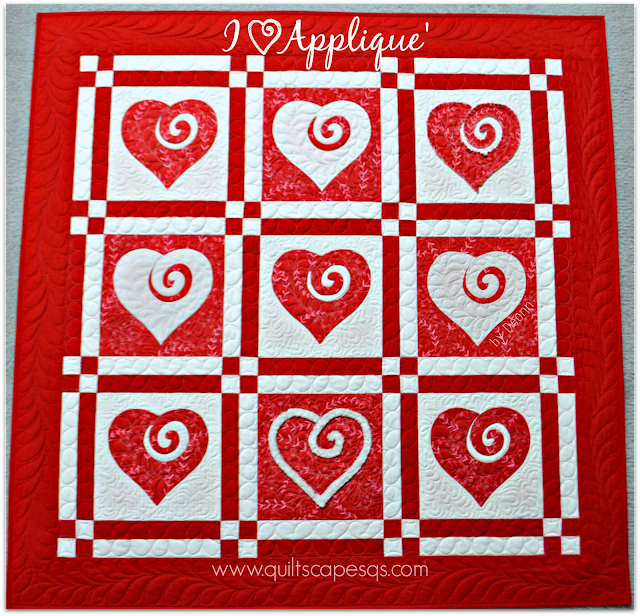 Love your quilt and all the ways to applique! I don't like hand work so I go the fusible/machine blanket stitch route. Love your quilting on it too...much easier to do with the machine then the pen for me! I like this a lot. My satin stitching is so so. I don't have a favorite really. 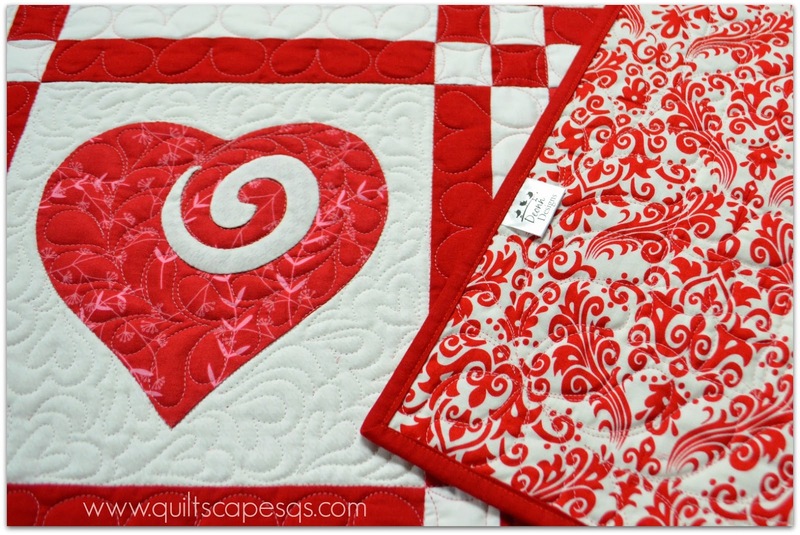 You can't go wrong when it comes to red and white Quilts. Love your project. Love your quilt and quilting! I am just getting started with applique, and I have to say I like the speed of raw edge applique, but sometimes that's not the look I want. I want to get better at needle turn applique. I've also recently done applique using the starch method. Beautiful quilt Deonn and than you for sharing the tutorial! Your quilt is awesome! I haven't done much applique yet. I think it is a skill I should work on. That is so pretty, Deonn. Just love it. Such a cute quilt, thanks for the patterns and showing how you did the quilting. Inspiring. Love your design and I love applique both by hand and machine . I love applique! I usually use fusible or glue and machine stitch the raw edges. 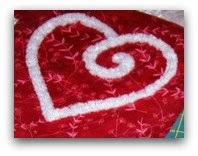 This is a great heart applique. 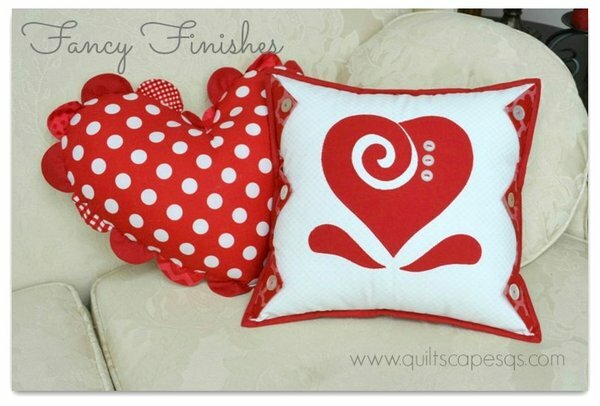 Your heart quilt is just lovely and I really love the matching pillows. Polka dots are one of my many favorites. just adorable! love the applique and also the heart quilting, that's so clever!